Every business has a certain way of doing things. Whether formally or informally, there are policies, practices, procedures, and routines that help the business operate as smoothly as possible. But, sometimes, your normal way of doing things makes it difficult or impossible for customers with disabilities to purchase your goods and services. This is why the ADA requires businesses to make “reasonable modifications” in their usual ways of doing things when it is necessary to accommodate customers who have disabilities. Most accommodations involve making minor adjustments in procedures or providing some extra assistance to a customer with a disability. Usually the customer will let you know if he or she needs some kind of accommodation. in a dressing room. A friend is helping her. 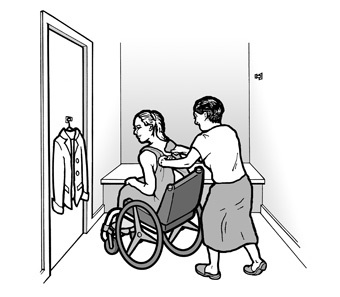 A clothing store may need to relax a policy of permitting only one person at a time in a dressing room for a person with a disability who is shopping with a companion and needs the companion’s assistance in order to try on clothes. A store that requires a driver's license as identification for paying by check may need to accept an alternative form of identification from a customer with a disability that disqualifies him or her from getting a license, such as a state-issued picture ID for non-drivers. 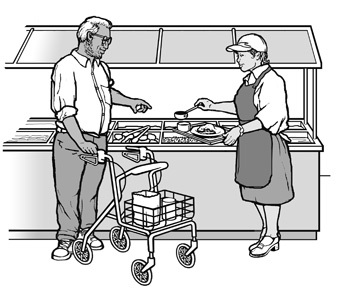 A store employee may need to help an older customer using a walker or someone with limited use of his hands or arms, by carrying a bulky item to the store's check-out counter. A restaurant may need to assist a customer who is unable to use both hands to cut his or her food, by cutting the food into bite-sized pieces. A grocery store employee may need to assist a customer who uses a wheelchair, by retrieving merchandise from a high shelf. Staff may need to help a customer who has an intellectual disability in understanding product labels or instructions. The ADA does not spell out exactly what you must do in every situation. It lets you decide what is reasonable based on how your business operates and what kind of accommodation the person needs because of his or her disability. The idea is not to exclude a customer by being unwilling to make an accommodation that is fairly simple and easy to make. tray of food for a customer using a walker. It is reasonable to provide some extra assistance to a customer with a disability when needed, even during busy periods when other customers are waiting. When only one staff person is on duty, it may or may not be possible for him or her to assist a customer with a disability. The business owner or manager should advise the staff person to assess whether he or she can provide the assistance that is needed without jeopardizing the safe operation of the business. A customer with a food allergy may ask a restaurant if it is possible to omit a sauce or ingredient from a dish he or she wishes to order. When it is easy to do, the request should be honored.